This piece consists of a structure of six small drawers to the top, three drawers to either side of the cupboard with fine quality pierced brass gilt gallery to the top and applied ormolu mounts. The drawers consist of burr walnut veneer to the fronts all with intricate boxwood stringing and banded with tulipwood with inlaid boxwood decoration, the bottom right hand drawer fitted with a pen compartment. The central cupboard being inlaid with boxwood, the door having a fine quality brass lattice work panel with red silk fabric lining and an escutcheon with key which can be locked, the interior of the cupboard having one shelf, the cupboard being lined with red velvet fabric. This leads down to the desk section which is of serpentine shape, veneered in burr walnut with a central oval panel of original red Moroccan tooled leather which is in good condition, all framed with brass and gilt metalwork with an ebonised moulding. 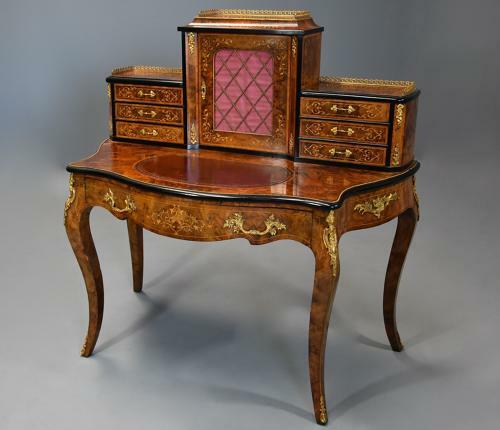 The sides and front are of serpentine shape veneered in burr walnut, the sides and side rails being shaped with ormolu mounts to the centre with boxwood stringing. This leads down to a burr walnut drawer to the front of the desk with fine quality decorative ormolu handles and mounts with central boxwood inlay all supported on four cabriole legs each having good quality ormolu mounts to both the top and base of the legs. This is an English piece of furniture, designed in the French style and is of excellent quality. This bonheur de jour is in excellent condition for age, is of stable construction and can go straight into a home.